Head gasket - What's going on here? Anyway, after getting all that out of the way, I found this. It doesn't really look that bad...at least I don't get the impression, based on the way it looks, that it's a constant flow or is a large qty of coolant. It almost looks like a leak that happened a long time ago and stopped....and I'm just seeing the remnants of the dried coolant now. So, curious to see what others might think of this. Harmless? Keep an eye on it? Don't go any farther and replace the head gasket NOW? This is a slow external coolant leak from the head gasket as you suspect - weather or not it has slowed or stopped on its own ( which in my experience is very unlikely ) . the condition of the gasket as a whole and what is occuring internally on the head sealing surface is a function of the condition of the gasket as manifested by this external leak. So the upshot is I would definitely pull the head and replace the gasket. I will warrant that you will find a well eroded head gasket. I hope this helps - let me know if you need anything else. Chris is correct. You have come this far, best finish pulling the head. You may just prevent a much worse failure that was about to happen. I saw this exact same thing on my car. I pulled the turbo at my dads house, needing to get home I put the turbo back on and went home. I then ordered the head gasket, but before I could get around to changing I developed a rod knock.... 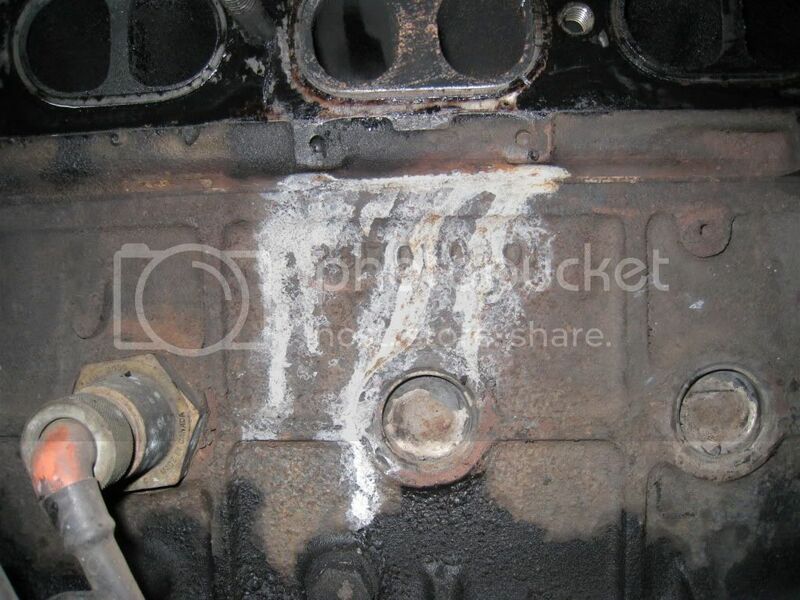 I assume the head gasket completely gave way and it dumped all its oil, thus the rod knock. Thanks, guys. Looks like I'll be pulling the head to take a better look at the gasket. In the meantime, I'm also looking at having the head 'serviced' while it's off. Wise decision. Wishful thinking has never worked too well for me when it comes to issues like this. I tend to lay awake at night arguing with the Mercedes Gods when I take a shortcut or avoid a job. Imagine a scene from the opera Die Niebelung. And waiting for the fat lady to sing. you need to learn to let go of these things!! Or you will be joining the Mercedes Gods far too early!!! No point worrying about things. Worrying causes 2 things; nervous break downs & stomach ulcers, neither of which help solve the problem. Dont worry be happy!! The problem will still be there for you to solve in the morning!!! Would like to know of any others who have tried this sealer to fix a blown gasket/cracked head. Years ago we let a 56 Chevrolet sit out during winter and cracked a block, about a 2 or 3 inch crack if I remember ( it has been 30 + years ago ).We ended up using a K&W Block seal as a last resort. Actually fixed the leak, and we drove car for anothjer year os so ,traded/sold/who knows what but running when it left. I know these sealers are a last resort, but I'm thinking : if you have a suspect leak, and either can't fix it now for weather or financial reasons, would it be a smart move to try to seal it now, before it gets really bad and hydrolocks an engine, or hope it holds till better days show up ??? In the case of the Poster, his being able to do the work and he has some of the parts removed, and the cost of the product which is close to the cost of a new Head Gasket. I think the Poster is better off replacing the Head Gasket. Also I believe there are other products that cost less and do the same job.